Winthrop House is being renovated and enlarged. The University’s endowment was valued at $35.7 billion last June 30, the end of fiscal year 2016—a decrease of $1.9 billion (5.1 percent) from a year earlier. The fiscal 2016 depreciation reflects a negative 2.0 percent investment return, and the effects of distributing $1.7 billion for Harvard’s operating budget, offset somewhat by gifts received as a result of the Harvard Campaign (see “$7 Billion, and Counting,”). The investment losses, announced in a September 22 letter from Robert A. Ettl, who became acting CEO of Harvard Management Company (HMC) last May, are a clear disappointment. While pointing to difficult external conditions (he cited a “low interest rate environment and market volatility”), Ettl also bluntly wrote, “[W]e recognize that execution was also a key factor in this year’s disappointing results.” Indeed, HMC’s aggregate performance trailed its market benchmark by 3.0 percent: a gap of well more than $1 billion. The latest results reduced HMC’s cumulative annualized returns for the past five- and 10-year periods to 5.9 percent and 5.7 percent; during the past year and five- and 10-year periods, a domestic portfolio consisting of 60 percent stocks and 40 percent bonds (essentially, an unmanaged, indexed pool of funds) yielded 5.0 percent, 8.9 percent, and 6.9 percent. The year was supposed to have begun a crucial transition for HMC, with revamped asset-allocation systems, internal investment processes, new personnel, and strengthened relationships with external money managers—all outlined in 2015 by new HMC president and chief executive Stephen Blyth—setting the stage for stronger investment returns. (His sweeping agenda is detailed at harvardmag.com/hmc-overhaul-15.) He set as goals earning a real return of 5 percentage points above the rate of inflation in higher-education costs (to accommodate annual distributions of about 5 percent of the endowment’s value, while securing its long-term purchasing power); a sustained aggregate performance of at least 1 percentage point above HMC’s market benchmarks; and top-quartile performance compared to 10 university peers (versus Harvard’s bottom-quartile ranking in the four most recent five-year periods). Although Ettl’s report conveyed a strong sense of continuity with the directions Blyth had outlined, the investment performance was brutal in certain asset classes (see chart), and new challenges emerged. The domestic equity portfolio, for instance, produced a return of negative 4.9 percent (versus a positive 2.5 percent benchmark return); as Ettl noted, “Unfortunately, a number of our domestic equity external managers underperformed for the first time in many years,” as several of those managers also “held closely correlated portfolios,” particularly in underperforming sectors, “further impacting the performance of the asset class.” Internal performance was such that the management team was downsized in June, with assets being transferred to outside investors. The foreign and emerging-market equity portfolios had returns of negative 14.2 percent and 12.0 percent, respectively (in difficult markets for those sectors); they and other equity portfolios are scheduled to report to a new head of absolute-return and public-markets funds, who is to be hired. Natural resources has long been an area of significant strength, with successful, pioneering investments in timber and agricultural lands and, in recent years, deft portfolio management to avoid the fallout from plunging oil, natural gas, and commodities prices. No longer: in fiscal 2016, HMC’s assets produced a negative 10.2 percent return, versus positive market performance. A new managing director is on the way, following the retirement of the head of alternative investments last year. The Harvard Campaign has fortunately been infusing hundreds of millions of dollars into the endowment. In the near term, that buffers its value when investment returns are weak, as in fiscal 2015 (5.8 percent), or negative. But the campaign itself entrains higher University operating costs to be defrayed (for the upgraded undergraduate Houses, for instance—see “Paying a $1.4-Billion Repair Bill”—and the 550,000 square feet of new engineering and applied sciences facilities under construction in Allston). In the longer term, the new assets, contributed to bolster financial aid, underwrite professorships, and underpin entire schools (public health, engineering and applied sciences), must be invested so as to support significant annual distributions and growth above inflation. Any capital campaign is premised on a surge in current-use gifts—now happily amounting to more than $400 million per year for Harvard, about 10 percent of operating revenues—followed by a gradual ramping-up of distributable investment income, as pledges for endowment gifts are fulfilled, the assets are invested, and funds begin flowing to their intended purposes. The deans whose schools are on the receiving end now must hope that the expected investment returns on those campaign capital gifts indeed materialize, as current-use giving levels off or declines post-campaign. Under the Corporation’s distribution formula, the fiscal 2016 decline in the endowment’s value is likely to turn anticipated growth in the funds sent to the schools in fiscal 2018 into level sums instead (after a 6 percent increase in the distribution during fiscal 2016, and a scheduled 3 percent rise this year). That should prompt prudent belt-tightening this year. The University as a whole, a $4.5-billion enterprise, can manage as the Corporation taps on the brakes, constraining growth in one-third of revenues. But for highly endowment-dependent units—the Radcliffe Institute, Harvard Divinity School, and the Faculty of Arts and Sciences (FAS) all derive more than half their income from those distributions—adjusting may be much more uncomfortable. For units operating at a loss now (on a cash basis), including FAS and its engineering school, and Harvard Medical School, the squeeze is tighter still. And beyond these current impacts, deans will have to lower the trajectory of their long-term financial projections. The leverage is huge. The University’s financial model assumes it can distribute about 5 percent of the endowment’s value each year. 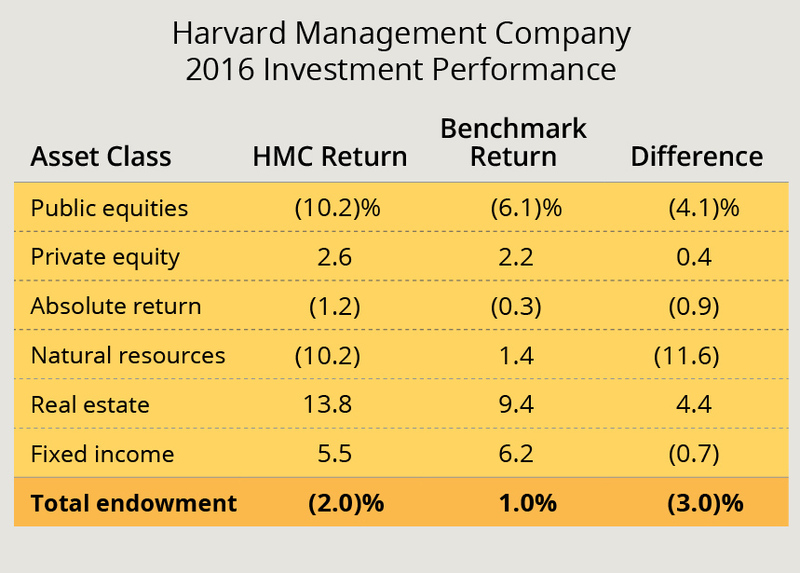 At present, if investment returns reach 10 percent, the annual increase in value enables Harvard to fund the operating distribution and retain an equal sum to support its future academic programs. But in a year like fiscal 2016, when the assets depreciate modestly, and the University makes normal distributions for the budget, the decline in value essentially offsets all gifts for the endowment received during the course of the capital campaign to date ($1.5 billion from fiscal years 2011 through 2015, plus the 2016 sum to be reported this fall): the proceeds realized from six years of concerted private and public fundraising. Middling returns, like HMC’s 10-year annualized rate of 5.7 percent, condemn the University to treading water—at best. In real terms, the endowment is now worth several billion dollars less than its value before the financial crisis in 2008, and it is being relied upon to support a University budget that is about $1 billion larger. The intersection between that rate of return and the distribution rate means that the endowment’s purchasing power erodes. The nominal principal (not catching up with inflation) would then essentially grow only to the extent that it is augmented by gifts—and relative to a nearly $36-billion corpus, those gifts would have to be large to make a difference. Absent that level of philanthropic largesse year after year, if investment returns failed to sustain both the current distribution percentage and real purchasing power, the Corporation would confront an excruciating choice: running down the value of the endowment—foundational assets, meant to exist in perpetuity; or reducing the distribution rate—thus upending the financial model on which Harvard’s academic operations depend. So fixing HMC’s performance is critical. How to proceed? Without question, the organization needs to cultivate stronger relationships with demonstrably superior external asset managers. Blyth and others have acknowledged that, following the financial crisis, those relationships frayed as Harvard had to bolster liquidity: steps that required HMC to reduce commitments to fund future investments it could no longer assuredly pursue, and to limit the size of new commitments no matter how promising the potential opportunity. HMC will also likely want to gain experience with its more flexible asset-allocation model and to further develop its search for investment ideas that cross conventional asset classes (priorities Blyth and Ettl both emphasized). As noted, the organization continues to recruit new personnel—most consequentially, the appointment of Narvekar as the new president and CEO, effective December 5. Above all, perhaps, HMC needs stable senior leadership, given the transitions from Jack R. Meyer to Mohamed El-Erian to Jane L. Mendillo to Blyth, with interim CEOs filling the gaps, just from 2005 to 2015. Depending on Narvekar’s strategy, it is also conceivable that further instability lies ahead locally. HMC’s hybrid system, with a significant share of assets invested internally, means that it has a large staff (175 to 250 people during the past decade or so)—and that its leader has significant day-to-day management responsibilities. Many peer endowments like Columbia’s, which rely largely or exclusively on external investment managers, select them and oversee their performance with a small core staff (typically, 20 to 40 people in all). In such systems, the leader of the team is principally a chief investment officer. Transitioning from HMC’s recent performance record toward the ambitious, essential return goals Blyth outlined will take time: many existing assets are invested in illiquid, long-term portfolios, and as assets and future cash flows are redeployed, the hoped-for, improved returns will emerge only gradually (as in the real-estate results cited above). HMC’s new leader already faces a huge performance challenge; meeting it may also require him to make the most basic decisions about what kind of investment operation the University requires to succeed in the twenty-first century.